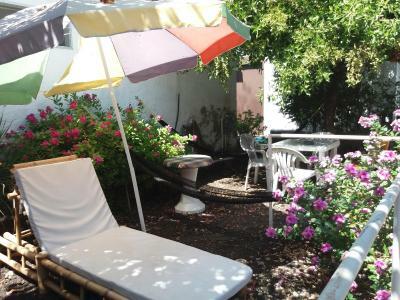 Lock in a great price for Hospedaje Darwin B&B – rated 8 by recent guests! Excellent location right in the center. Free water and instant coffee. Runned by a second generation family in galapagos, the know very well the place. They also provide arrangement for your daily planned trips or bookings. They are very accomodating specially the daniel and the mother. They have water refills and location is very near from the harbor. They singlr room is good for 3 person. Very quiet place. The lady running the place is an angel, she helped us a lot with our organisation, though we had some communication problems ;) The employees are more reserved but nice. The location is a 2mn walk from the pier, right in the center of the town. Room was great! Air con was fantastic. Shower took a while to get hot and temperature was changeable but powerful and spacious! Fresh towels and made the beds/ changed bin frequently. Man on the front desk was very helpful and took his time to go through best places to visit. Breakfast not included but could pay $5. Kitchen not for general use but fridge available. Excellent location. We stayed here twice. The first room we were given was a great deal (special promotion on Booking). It was fan only, so it was hot in there, but no complaints for the price. I would suggest adding a second fan to the room for guest comfort. Overall, the room was spacious and clean. My booking reservation said breakfast was included in the price, but the hotel refused to provide us with breakfast. If you aren't going to provide the service you say you will on Booking.com, then change it online! Very nice staff and very helpfull! 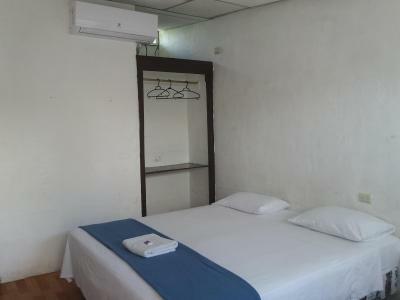 Also the touristic agency integrated in the hostel has very good offers. La ubicación del lugar. Está en el centro y puedes llegar caminando al muelle y está a una cuadra de diversos lugares de comida típica. La atención brindada fue muy buena y amable en todo sentido. 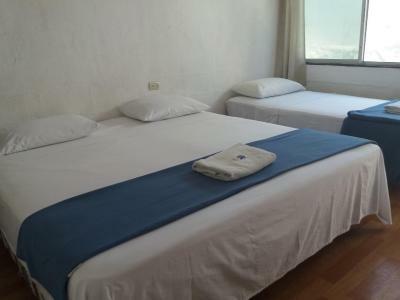 Located in Puerto Ayora, a 7-minute walk from Tortuga Bay, Hospedaje Darwin B&B has air-conditioned rooms with free WiFi and a tour desk. 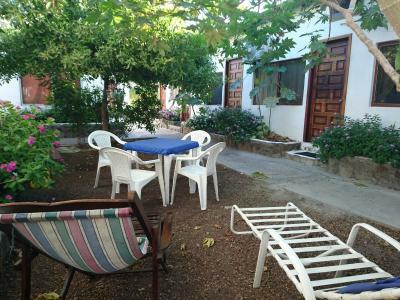 Offering a garden, the property is located within 1,800 feet of El Garrapatero Beach. Staff on site can arrange airport transportation. At the guesthouse, every room includes a desk. Each room comes with a private bathroom with a bath. The rooms include a closet. 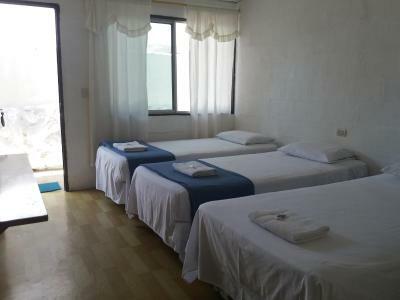 뀐 Located in the top-rated area in Puerto Ayora, this property has an excellent location score of 9.4! When would you like to stay at Hospedaje Darwin B&B? House Rules Hospedaje Darwin B&B takes special requests – add in the next step! Check (domestic only) Hospedaje Darwin B&amp;B accepts these cards and reserves the right to temporarily hold an amount prior to arrival. Hospedaje Darwin B&B accepts these cards and reserves the right to temporarily hold an amount prior to arrival. The advertised room facilities like hot water, fridge, etc were not available in my room. Instead I got ants and bugs. Shower not always hot. Drains smelt a bit dodgy at times. Cant tell anything that dissapoints me. Wifi was unusuable and they have an excellent kitchen but the guests aren't allowed to use it. Booked here a second time in person for one night before going to the airport. We paid full price for a room with hot water, AC, and breakfast. We double checked that the room would include breakfast and were promised it would. When we arrived, it seemed clear they forgot about our reservation. We were put in a room that I don't think they normally rent out for guests. Small, dingy room with dirty sheets, no hot water, and broken light bulb. Multiple local people knocked on our door throughout the evening and were surprised when guests opened the door instead of staff. In the morning, once again, they refused to give us breakfast! So, we paid full price for sleeping in their staff room with no hot water and no breakfast.